My first official fundraiser for Team in Training is now open! I am working with a great supporter Run Find Your Happy Pace and putting together a virtual 5k/10k called The Great Cupcake Race! 1. Register through PayPal by clicking the button over to the right.......if you don't have a PayPal, please email me at run.in.sanity@gmail.com for other instructions! 2. Sometime around September 8, you go out and cover the 5k or 10k distance. You can run, walk, crawl, cartwheel, skip, whatever you choose! Just get out and move! 4. Know that you've supported the Leukemia and Lymphoma Society because all proceeds from this race will go towards my fundraising goal! It's that simple! But if you have any questions at all, please don't hesitate to ask! Nope, not the cute kiddo.......see the Bondi Band she is modeling? 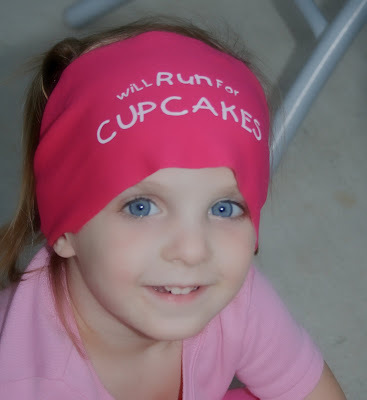 You too can have a hot pink "will run for cupcakes" sweat wicking headband! You'll see an option for "race and bondi". You can purchase both for $27. A portion of each bondi band sold will go towards my fundraising goal as well! You can also just purchase the race $20, or just the bondi band $8! Thank you for your support, and please share with your friends! Yay..... Thank you for your hard work. now I'm training for Nike this Oct. I am just now finding your blog and facebook page. I wish I would have known before about your race. Anymore coming up soon?